This call for unity amongst diversity is as important now as it was when Dr. Martin Luther King Jr. voiced it over 50 years ago. As a member of the St. Louis community, we all have to play our part in bringing this call to fruition. This is why Better Family Life (BFL) is making a big push to embrace the richness of our diverse community. Striving to broaden our youth population, BFL has improved communication with traditionally underrepresented populations, increased activities to attract diverse employees and volunteers, increased visitation and presentation at area elementary, middle and high schools in order to attract students of various nationalities to our programming, and conducted diversity centered programming such as our upcoming Junior Unity Ball. 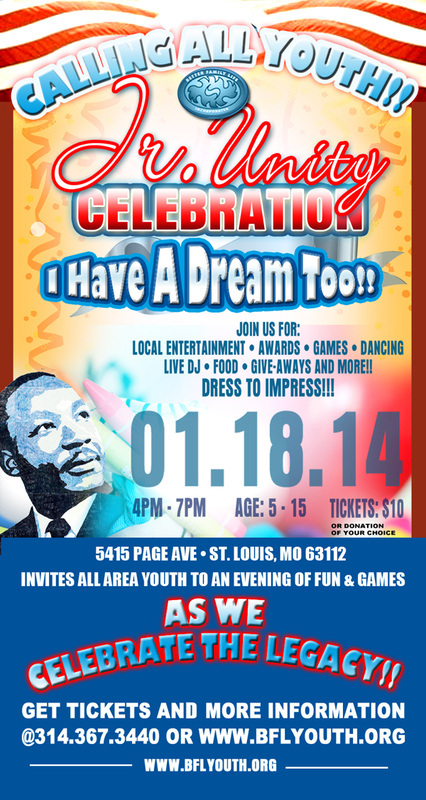 On January 18, 2013, from 4 pm to 7 pm at the Better Family Life Culture, Education and Business Center, located at 5415 Page Ave St. Louis, MO 63112, Better Family Life is hosting its Annual Jr. Unity Ball. The Ball will serve as a fun and educational backdrop for members of the youth community to celebrate Dr. Martin Luther King Jr. Day and to become empowered and excited about the unity amongst diversity message that he embodied. Better Family Life Annual Jr. Unity Ball is an evening to engage our youth in an evening of formal and traditional dress. There will be local entertainment, awards, games, dancing, a live DJ, food and great give-aways. As a sponsor, we are hoping to garner monetary or in-kind donations to help in our quest towards unity within the youth population of the St. Louis metropolitan area. Our goal is to raise $10,000 to host the event. Any additional funding we receive will be used for our S.A.F.E. passage summer camp; other youth related activities. Additionally, tickets can be purchased from the Better Family Life Youth Department, located at 5415 Page Ave St. Louis, MO 63112, by calling 314-454-0622 ext. 701, or online via paypal at www.bflyouth.org. Better Family Life is a 501© 3, not-for-profit organization devoted to bettering the lives of families within the St. Louis Community. It is committed to offering quality, essential services to a variety of people in the hopes of creating a stable, well developed community overall. With your help this pursuit becomes closer to completion each day. We hope you see the long-range merit and potential of this event and become one of its most active supporters.